Well, Lynnette and Jim are coming, so you can expect showers. Chances are good that you’ll see plenty of rain. Other than that, it should be nice and pleasant. Yes, it always rains on us whenever we’re there… even in a Jeep. 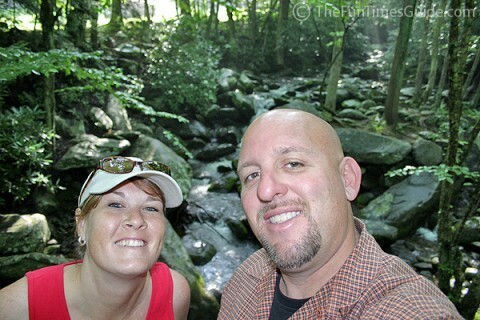 If you like, you can follow along to see how we spent the weekend in Gatlinburg TN. Sometimes we get bonus points for being spontaneous. Other times we consider ourselves complete idiots for our lack of planning! We would have liked to camp on this visit to the Smoky Mountains. 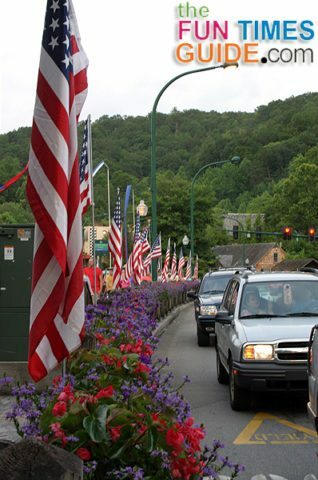 But on July 2nd, every campground within 40 miles of Gatlinburg was booked solid over the Fourth of July holiday. Fortunately, we had gotten our camping “fix” a few weeks earlier. So we found a cheap (by “Gatlinburg on the 4th of July” standards) hotel near Traffic Light #8. It was the Sidney James at 610 Historic Nature Trail/Airport Road. The rate was $89 a night. For those who don’t know, you find your way around downtown Gatlinburg in relation to the street lights — numbered 1 through 10. We’re not really into all the touristy stuff around Gatlinburg, so we were glad to be somewhat near the end of the strip — easy in, easy out in terms of traffic. There was a great little Mexican Restaurant right down the street — and everyone knows how we love Mexican food! The trolley made frequent passes up and down our street — taking people from the hotel anywhere from traffic light #1 to Pigeon Forge. 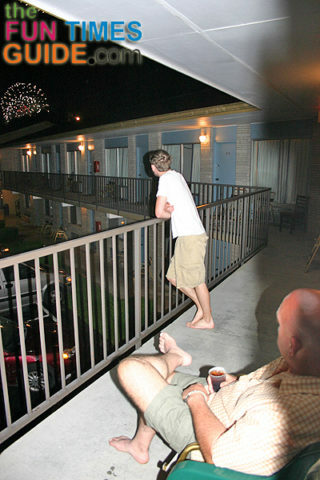 Our hotel room came with a balcony which faced the street — in perfect view of the Gatlinburg fireworks display which took place at midnight on July 4th. Talk about a party on the porch! There was a hidden gem at the end of our road. Where our hotel’s parking lot ended, a little-known auto touring route began. 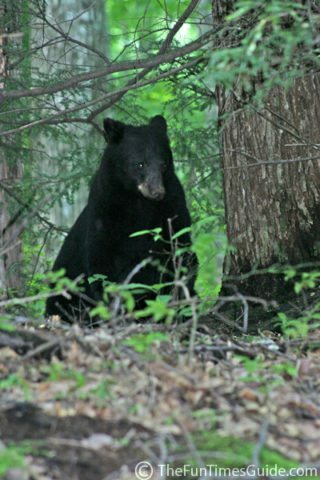 It’s called the Roaring Fork Auto Driving Tour, and it’s a haven for black bears, deer, and turkey by the dozens. A fun road for a leisurely drive. For the most part, I did the photographing, while Jim did the video blogging. 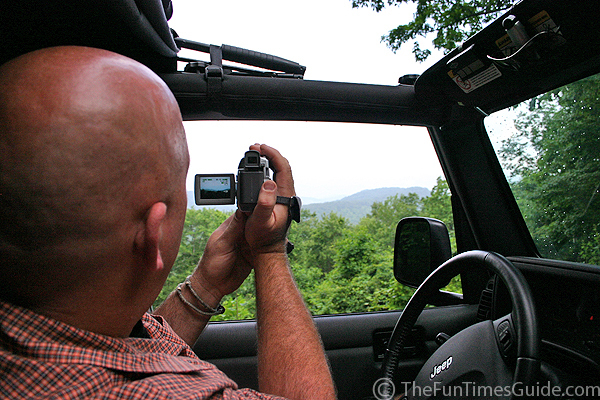 In all, we shot more than 600 photos and 100 MB of video during our 3-day/2-night/825-mile Jeepin’ adventure in and around Gatlinburg. More Fun Places To Ride In A Jeep – the Southern Four Wheel Drive Association has compiled a nice list of fun rides in the southeastern U.S. 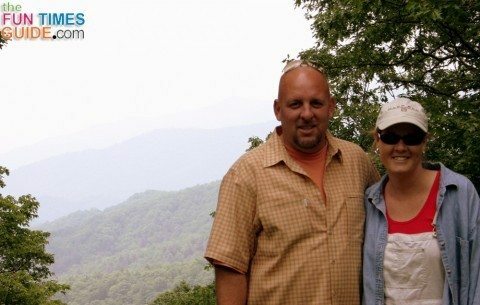 Both the Tail of the Dragon and Cherohala Highway are favorites of motorcycle drivers. People drive from all the surrounding states just to experience these narrow & twisty roads. But trust me, it’s fun in a Jeep too! Overall, it was a weekend filled with lots of spontaneous adventure. We definitely had a ton of FUN.